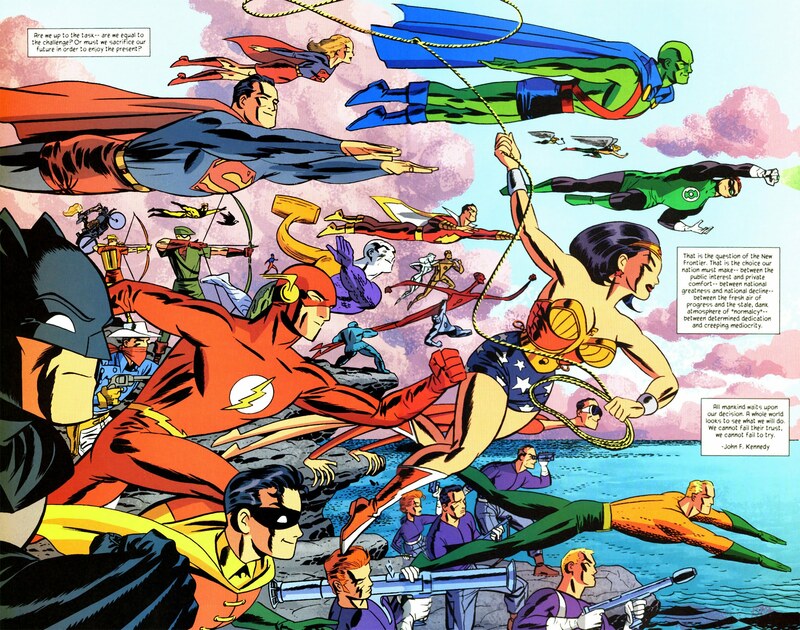 Art from ‘DC: The New Frontier’ by Darwyn Cooke. Gobbledygeek episode 350, “DC: The New Frontier (feat. Eric Sipple),” is available for listening or download right here and on iTunes here. For this month’s superheroic Four-Color Flashback installment, Paul and Arlo set out for lands unknown with the late, great Darwyn Cooke’s DC: The New Frontier. Cooke’s ambitious 2004 limited series bridges the gap between comics’ Golden Age and Silver Age, paying nostalgic tribute to the fictional heroes of that time while using the era’s form and style to comment on the day’s social and political ills. They’re joined on their voyage by The Avatar Returns co-host and The Deli Counter of Justice co-creator Eric Sipple. The gang discusses Cooke’s artwork, striking and cinematic in ways few others comics have achieved; how Cooke wisely keeps Superman, Wonder Woman, and Batman in the background to focus on new heroes like Green Lantern and the Flash; how the story of J’onn J’onzz, the Martian Manhunter, compares to that of African-American freedom fighter John Henry; the pretty good animated adaptation; and more. Plus, Eric has some personal news; SDCC happened, including a slew of trailers for the likes of Shazam, Aquaman, and more; and Nathan Fillion gets his Nathan Drake on in the Uncharted fan film. Next: the end is out there. Wesley “Wezzo” Mead joins Paul and Arlo to talk The X-Files one last time, as the gang discusses the big screen continuation I Want to Believe and both revival seasons. This entry was posted in Four-Color Flashback, Shameless Self-Promotion and tagged action, adventure, animation, aquaman, batman, books, cartoons, comic books, comic-con, comics, darwyn cooke, dc, dc extended universe, dc the new frontier, dceu, eric sipple, fantasy, film, flash, gobbledygeek, graphic novels, green lantern, itunes, john henry, justice league, justice league the new frontier, libsyn, literature, martian manhunter, movies, nathan fillion, podcast, san diego comic-con, sci-fi, science fiction, sdcc, sdcc 2018, shazam, superhero, superheroes, superman, the new frontier, uncharted, war, wonder woman. Bookmark the permalink.